I do love books. I do like to be beside the seaside - or any body of water, for that matter. I can't think of a better day than one spent with a good book, spread out on the beach, or a duck pond, on a lovely warm day. Add a cup of tea and we're golden! I also like boats and seafaring. There's a problem - just like I'm a Cat Lady who's allergic, I tend to get egregiously seasick. What a cruel fate! When I find a boat I can spend more than five minutes on, it's a delight! In New York, I love the Staten Island Ferry for its excellent and totally free views of downtown Manhattan, Brooklyn, and the Statue of Liberty (and, I guess, Staten Island). Last year I finally visited Governors Island, and I can't wait to return. I can take a ride down the Thames to Greenwich without consequences so far. However, I'm wary of booking cruises because I've heard stories from people with better stomachs than mine. It's a shame. We're getting to my point pretty soon. I've also had a fascination with houseboats for quite some time. Not yachts - the word 'yacht' brings on the cringe, bringing me visions of Wall Street and the 80s, and the arms of sweaters tied around one's neck, and Kennedys bobbing about my head. I might need some Dramamine. Houseboats are cozier, presumably less ostentatious, and give off the vibe of a simpler life. Is it a simpler life? Every choice has its complications. There's always some fee to pay, neighbors to put up with, weather issues, and my favorite worry - plumbing. If you've got it all figured out though, it could be a nice existence - and it's a portable home, if you're prepared to raise anchor and avast (I'm not the best person to consult for nautical terms). 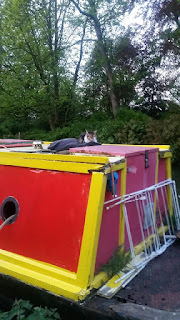 I personally could not see myself living permanently on a houseboat, but I wouldn't talk someone else out of it. If I were in the money, I might want to own a houseboat - you get the best of both worlds here! I'd love to stay in one for a few nights, or even travel on one through canals, inner ear permitting. 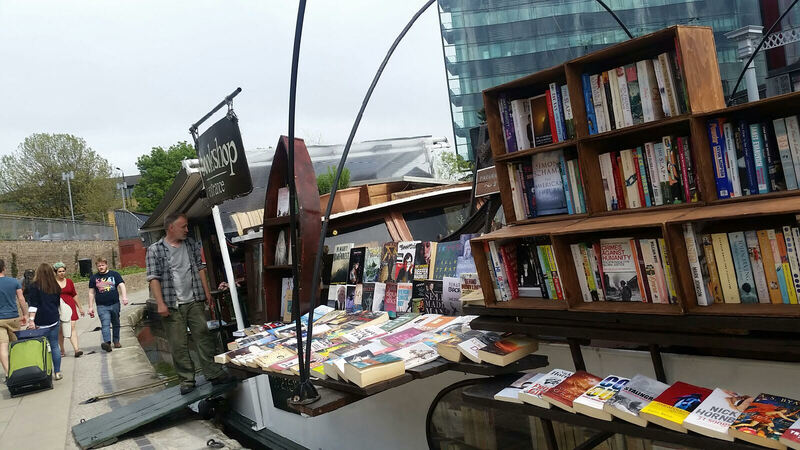 The most appealing adventure to me is the idea of running a bookshop on said vessel. That's food for many daydreams right there. 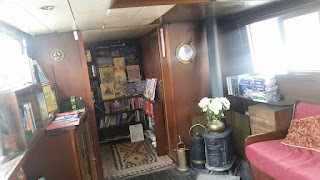 These options aren't happening anytime soon, so I comfort myself by living vicariously through novels and memoirs having to do with floating bookshops - and finally visiting one myself. 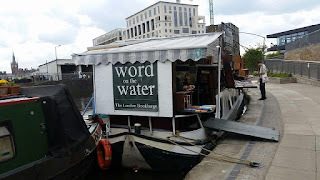 A couple of years back, I'd read about Word on the Water, and fully intended to go there during my November 2014 visit. Maybe it rained too much, or the directions were daunting, but I never made it. Well, everyone knows I love to leave London wanting more, so that's what I did. 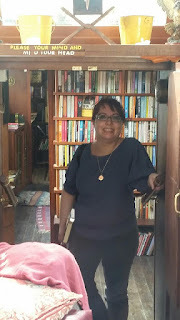 Shortly after this, I heard from a friend in London about a The Little Paris Bookshop, by Nina George, and what do you know? 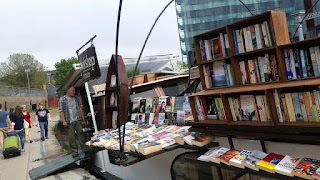 It was about a man named Perdu who owned a floating bookshop, complete with cats (squeal!) He operated as a literary apothecary, prescribing books for all sorts of ailments. That's kind of my dream job, by the way. Eventually, he and some stragglers take a journey around France with the bookshop, and, well, that's where it started to fall apart for me. It was too fanciful, and that's saying a lot for me. I retained my appetite for book barges, though. Back to this year. 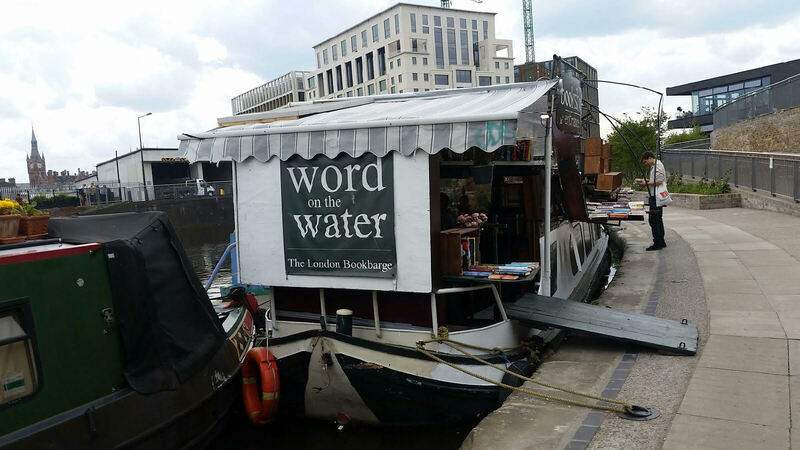 I follow Word on the Water on Facebook, and found out they were now in residence at the Regents Canal, near Kings Cross. The weather was glorious for the first leg of the trip, so I was not going to miss this opportunity. When we found it, I heaved a sigh of relief and joy. 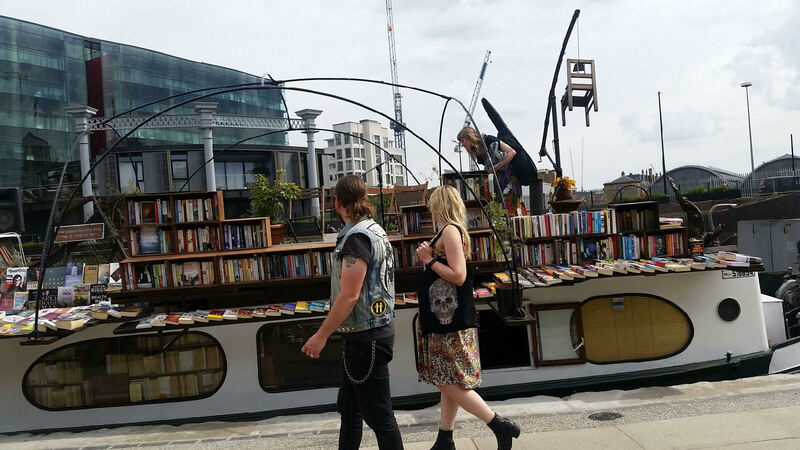 How did I get through half of a lifetime without being on a book barge? I mean, look at it! 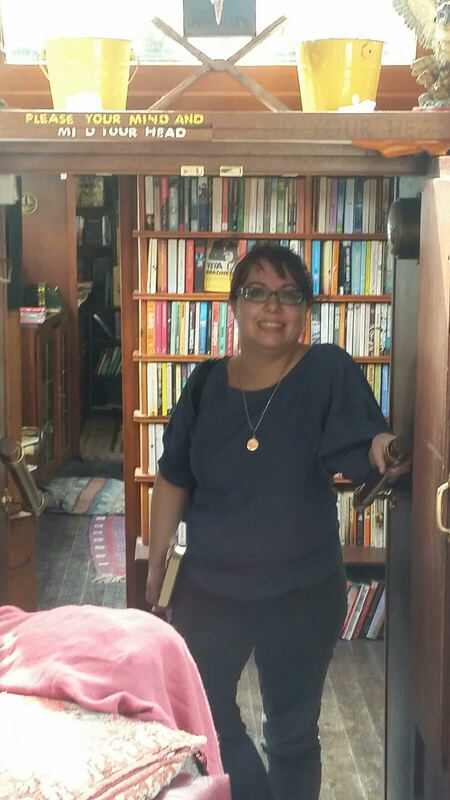 I spent some time browsing, bought one book (a Doctor Who book, which kind of worked because it felt bigger on the inside), and dreamed of staying on such a vessel for an extended period of time. My only regret was not finding out if there was a bathroom on board. That's usually the kind of thing I have an aptitude for, sadly. I did find the cozy! The greatest triumph laid in the fact that I didn't feel seasick at all. In fact, I didn't even feel the gentle swaying on the water; I didn't even realize it was swaying a little until I was looking at it from the outside. There were musicians on top of the boat between sets, and I had the predictably cheesy idea to do karaoke there. Thankfully I didn't voice it at the time. It's a good venue for a show, I think, because it attracts passerby who would have to be in a receptive mood, for the most part. I briefly talked to the proprietor there at the time, whose name escapes me because I was distracted by books. I liked him; he took his time, but in a good way. He was so laid back. I'd say you'd have to be, but stress could happen anywhere. I'll leave you with a shot from Oxford: the houseboat cat that was not as excited as I was. Anyway, I STILL need to visit Word on the Water!! Canal Laureate - where does one put that on a CV? Thanks for the link, I'm going to have more vicarious adventures!